Once you have installed and activated the trial for the Google Analytics connector, you need to log in to your Google Analytics account. 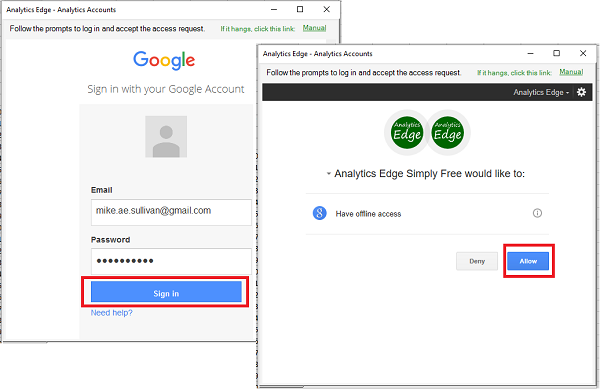 Analytics Edge will save your login credentials to make refreshes faster and easier, and you can log into as many different accounts as you want. From the Google Analytics (Free or Pro) button on the ribbon bar, select Accounts from the menu. The Accounts wizard will open. 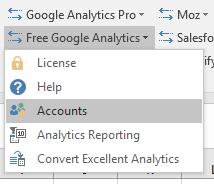 The Free Google Analytics connector and the Google Analytics Pro connector share their saved accounts, and they are upwards compatible from Free to Pro. 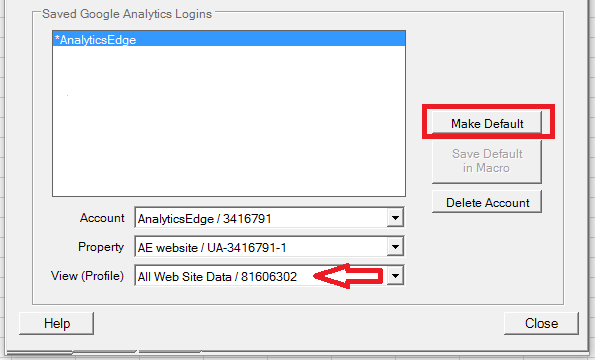 For security reasons, Analytics Edge stores your account information on your computer, not in the workbooks. Accounts are stored using Reference names, and the queries use a Reference name to identify which account to use. Before you can log into an account, you must enter a Reference name in the field provided, then click the Add Account button. The Google Analytics Pro connector provides two option checkboxes which must be checked if you want to use elevated permissions for uploading data or managing the account. Log into your Google Analytics account and Allow the application to have offline access. Select your new Account in the list at the bottom, pick the Property and View you want to use as a default, and click the Make Default button, then you can Close the wizard. This entry was posted in Google Analytics on 2018/07/24 by mike_sullivan.